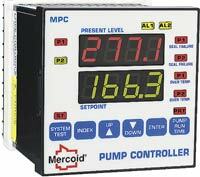 The Mercoid MPC Pump Controller provides versatile level control in a standard 1/4 DIN package. Designed for use with almost any style level transmitter the unit displays the present level and main set point value. Incorporated in the MPC is programmable level differential for on/off control of one or two pumps, valves, or other devices through two SPDT relays. Also featured are two additional programmable alarm contacts with front alarm light indication. The MPC is flexible and incorporates a user-friendly programming menu. The front face meets NEMA 4X for outdoor panel mounting. So many features are combined into the MPC that it eliminates many components in a pump control system. Selectable pump alternation when used with two pumps to minimize pump wear. With alternation "on" a seal failure or over temperature condition will force the non-failed pump to lead status and stop alternation. Test System function that simulates the process input to insure the pumps are operating or to test programming. Process input retransmission as a current (4 to 20 mA) or voltage (2 to 10 VDC) analog signal*. * Standard model MPC is set for current retransmission. For voltage retransmission add suffix "-RV". Inputs: 4 (or 0) to 20 mA DC or 2 (or 0) to 10 VDC selectable. Input Impedance: Current = 10 ohms, Voltage = 100 K ohms. Control Relays: SPDT, rated 10A @ 240 VAC res., 1/4 hp @ 120 VAC, 1/3 hp @ 240 VAC. Alarm Relays: SPST, 3A @ 240 VAC res., 1/10 hp @ 120 VAC. Control Type: On/off, reverse (pump out) or direct (pump in) acting. Power Requirements: 100 to 240 VAC nominal, +10%-15%, 50 to 400 Hz, single phase; 132 to 240 VDC nominal, +10%-15%. Power Consumption: 7.5 VA maximum. Display: Two 4 digit, 7 segment 0.56" high LED’s. Memory Backup: Nonvolatile memory (no batteries required). Serial Communications: Optional RS-232 or RS-485 with Modbus® protocol. Ambient Operating Temperature/RH: 14 to 131°F (-10 55°C)/0 to 90% up to 104°F (40°C) non-condensing, 10 to 50% at 131°F (55°C) non-condensing. Weight: 16 oz. (454 g). Front Panel Rating: Meets UL Type 4X (IP66). Loop Power Supply (isolated): 24 VDC @ 50 mA, regulated. Search Current: 3 micro amps. Resolution: 10K to 500K ohms in 10K ohm steps. Control direct panel mounts in the front of the enclosure. Enclosure includes a front hinge and lockable latch. Front plastic window with rear panel for mounting the control behind the window. Enclosure includes a front hinge and lockable latch. For compatible level transmitters see Mercoid Series SBLT and PBLT. RS-232 Modbus®-RTU Serial Communications. Allows remote computer to read and write all control parameters. RS-485 Modbus®-RTU Serial Communications. Allows remote computer to read and write all control parameters.